Adopting this title for her book, Anna Jeffery invited a few prominent people to select their own five gold rings, ie favourite poem, book, place, person, plus their philosophy of life. The result is a very thought-provoking anthology. But memories of a music on the breeze. 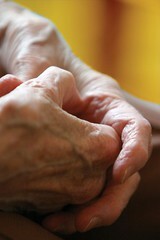 Pathos is woven through these lines, like a thread of gold. ‘Love is My Meaning, an Anthology of Assurance’, compiled by Elizabeth Bassett. This is an out-of-print collection of spiritual items which I believe deserves a wider readership. My favourite piece describes the annual arrival of spring, and is entitled ‘The Green Veil’. Having spent the past fifty or so years getting to know Snowdonia, my choice has to be the summit of Snowdon (height: 3560 feet). I am not a person who thinks that one is closer to God on the top of a mountain, but on this summit “the silence of eternity” is to be found. A difficult choice! During the Second World War our school was evacuated to a small town in South Wales, where a childless couple gave a home to me and my younger brother. Our host was a smelter at the local steelworks, and his love of the countryside, of walking, of books, of writing, and of the theatre, he generously passed on to me. Can you just imagine it… every second of every minute, of every day of our lives – “that awake we may watch with Christ?” What a staff to lean upon! 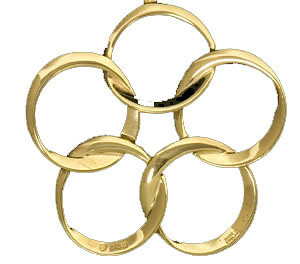 In sharing these personal reflections with you, I hope that I may have inspired you to consider your own “Five Gold Rings”…. 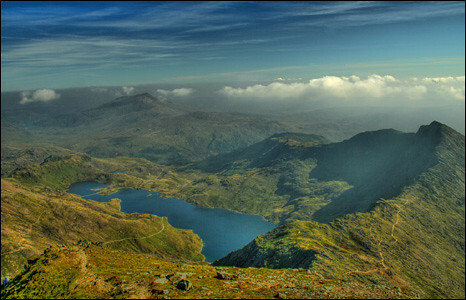 The photo from the summit of Snowdon is reproduced by kind permission of David Swales. What a lovely and thought provoking addition to the web site. It has made me think of my 5 golden rings, which is difficult as I have so many beautiful memories of books people, places, poems and songs. I will have to work hard to reduce them to 5! philosophy – If my name’s on it it will find me – this got me through the war years.